A happy, well-mannered dog can be a treasured companion and a true joy to live with. At Tappen Hill, we teach your dog good manners as well as basic and advanced obedience by using a gentle, positive, one-on-one approach. We have very few training slots available through the end of the year, please call our office if you would like more information about our training program. 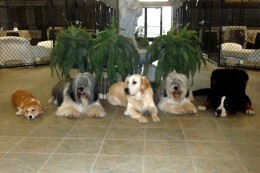 We generally take dogs between the ages of 6 months and 1 year for our boarding school program. The 3-week training package is $3500. This price includes all boarding and training while your dog is at Tappen Hill, and 3 or 4 cross-training review sessions after he goes home. Dogs that are accepted into the Boarding School Program enjoy a fun-filled, relaxing stay at Tappen Hill while participating in daily lessons during 3-week sessions. By using a combination of positive reinforcement, clear, concise boundaries and consistent, well-timed praise, we help your dog quickly and happily progress through the different training levels. In our Basic Program, your dog will learn to come when called, sit, lie down and stay. They also learn to walk easily and comfortably on a loose leash. And best of all, they have lots of fun doing it! At the end of your dog’s training stay, it is important for you to make time for two to three additional training sessions that are included in the Boarding School tuition. In these sessions, we work with you and your dog together, showing you what your dog has learned and how you can continue to reinforce his/her new behavior.